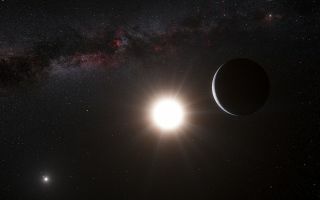 This artist’s impression shows the planet orbiting the star Alpha Centauri B, a member of the triple star system that is the closest to Earth. Alpha Centauri B is the most brilliant object in the sky and the other dazzling object is Alpha Centauri A. Our own sun is visible to the upper right. The tiny signal of the planet was found with the HARPS spectrograph on the 3.6-metre telescope at ESO’s La Silla Observatory in Chile. Image released Oct. 17, 2012. The recent discovery of an Earth-size alien planet right next door to us could help spark humanity's first true steps beyond our own solar system, scientists say. On Tuesday (Oct. 16), a European team announced the existence of Alpha Centauri Bb, a roasting-hot world residing in the nearest star system to our own, just 4.3 light-years away. The find could spur serious and sustained efforts to explore the newfound planet and any siblings it may have in the three-star Alpha Centauri system, say researchers not involved in the discovery. "This is a huge motivator for the future of sending probes outside of our planetary system and humans trying to figure out how to travel to another star system," MIT planetary scientist Sara Seager told SPACE.com via email. "I think the reality of a planet and the promise of more is a game changer." The news came as a surprise to some in the exoplanet community. "It reads like Poe’s short story 'The Purloined Letter' where Nature has hidden one of the most sought-after jewels in the field of exoplanet science in plain sight," said Jon Jenkins of NASA's Ames Research Center and the SETI (Search for Extraterrestrial Intelligence) Institute. "It’s quite a cosmic joke to think that we’ve been spending decades planning missions and observations to find Earth-mass planets orbiting much more distant stars and Nature hides an Easter egg just beside us," added Jenkins, who is analysis lead for NASA's prolific planet-hunting Kepler Space Telescope. The planet orbits extremely close to its host star Alpha Centauri B, completing one lap every 3.2 days. As a result, its surface is far too hot to support life as we know it. But recent exoplanet detections, including many by Kepler, show that small, rocky worlds like Alpha Centauri Bb tend to be found in multiplanet systems. "So, this would imply the chances are high that this star has other planets farther out, and perhaps one might be in the habitable zone," said David Charbonneau of the Harvard-Smithsonian Center for Astrophysics, referring to that just-right range of distances around a star that can support the existence of liquid water. Future space telescopes — such as NASA's proposed Terrestrial Planet Finder and the European Space Agency's Darwin instrument — could search for signs of life on promising worlds that may neighbor Alpha Centauri Bb, said veteran planet hunter Geoff Marcy of the University of California, Berkeley. "Those missions can not only image planets in the habitable zone but take spectra of them, to assess the chemical composition of the atmosphere of the planet," Marcy told SPACE.com via email. "There is a prospect, with planets around Alpha Cen B, to search for bio-signatures in the atmosphere of any planets in the habitable zone." That would be exciting enough. But Marcy and some of his colleagues hold out hope that humanity will get a much closer look at the Alpha Centauri system someday — and they think now is a good time to get the ball rolling. "There is now great impetus to send a probe with a camera to Alpha Cen to study the three stars there (including Proxima Centauri) and to study the planets and moons there," Marcy said. "What a rich opportunity for NASA and ESA, working with all nations on Earth, to send a probe to Alpha Centauri, galvanizing interest from people of all ages around the world." Such a mission is not practical with today's spacecraft, which would take tens of thousands of years to travel the 25 trillion miles (40 trillion kilometers) to Alpha Centauri. So researchers will have to come up with new, superfast propulsion systems — perhaps nuclear rockets, antimatter fusion drives or another such advanced technology in the early stages of development today. Marcy thinks the world should aim to launch a robotic spacecraft toward Alpha Centauri by the year 2100. "The president of the United States, after his election in November, should lead a vigorous new NASA program," he said. "We should study the prospective propulsion methods that can launch a probe to Alpha Cen before the century is out, returning data back safely to Earth." The time may be right to start laying the groundwork for such an ambitious mission. The world is buzzing about Alpha Centauri Bb, a planet found in a star system familiar to many people from countless sci-fi novels, TV shows and films. "Knowing that these distant horizons exist will inspire generations of explorers," said Natalie Batalha, deputy leader of the Kepler science team at NASA Ames. "Why climb the mountain? Because it exists," she told SPACE.com. "That's the human spirit, and it brings with it infinite possibilities — for practical things like technology that improves the human condition and the reality of interstellar exploration but also for lofty things like evolution and global cooperation and who knows — maybe even knowledge of other life in the universe. One can dream."